Pay homage to land and sea with this prosciutto wrapped scallops recipe. Taste buds excite with flavors of plump and juicy scallops tossed with the mellow nuance of Prosciutto di Parma, which offers superior flavor and more sophistication than using just bacon. 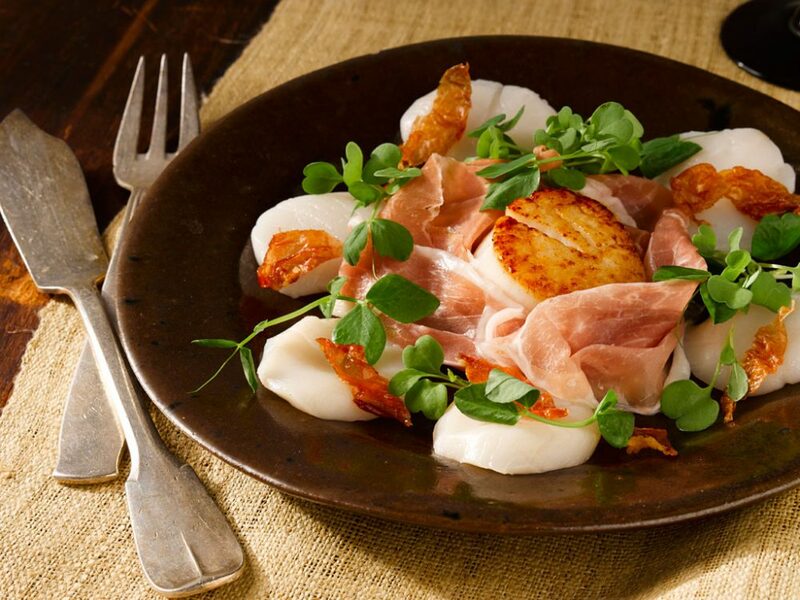 Scallops and prosciutto are a sure-fire pair because they both have a faintly sweet aroma and palatable texture. With just a few simple ingredients, this prosciutto wrapped scallops dish adds considerable elegance as a starter to any meal. To cleanse the palate and prepare the taste buds for another bite, pair with a German or Bohemian Pilsner. With a paper towel, pat scallops dry. Thinly slice crosswise 2 of the scallops, creating 2 to 3 slices per scallop. Heat a skillet over medium-high heat; add oil and heat until hot. Pat remaining scallop dry once more; sear until browned and crisp, 2 to 4 minutes. Turn scallop; sear until well browned and almost firm to the touch, 2 to 4 minutes. Transfer scallop to center of a serving plate. Place one slice of the prosciutto in the hot skillet, cook, turning once, until crispy; remove to paper towel to cool. Drape remaining slice of prosciutto around seared scallop; crumble crispy prosciutto over scallops. Garnish with microgreens.